I received no compensation whatsoever for this post. I'm writing it because I want to. I am a big proponent of teaching children to read stories - both to themselves and aloud - well, and to be able to make stories up on the fly. The ability to tell stories well is a dying/lost art and I intend to do my part in resuscitating it and then fostering its growth in the world at large. I know that not every individual is skilled in this lovely art of story telling but I think everyone can reach a certain level of proficiency if they practice. I think it's important to do this for numerous reasons, each which would take a long post to describe and defend. Truth is very easily communicated through story. If you want to connect with someone to share a truth in a non-threatening way, try a story. They will usually listen longer. In a Facebook/Twitter World where we are supposed to limit ourselves to 2 lines of text - (I have totally given up on doing that, by the way) - we have lost the ability to form cohesive, lengthy thoughts. It is a good habit to practice telling stories because it requires that you string together a variety of thoughts and ideas, while dropping in a smattering of facts and fancies, and still be able to tie things up neatly (and coherently) in the end. It is my desire that all of our children are at least practiced in the art of story telling. I think it will make them better conversationalists and wiser people if they work at this a bit. 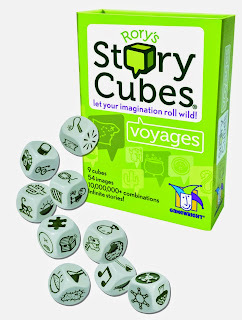 I'd like to eventually pick up another cube set (or two) to add some variety to our story telling but since we're just getting started I think too many choices would overwhelm. Each roll of the dice produces a different combination each time. 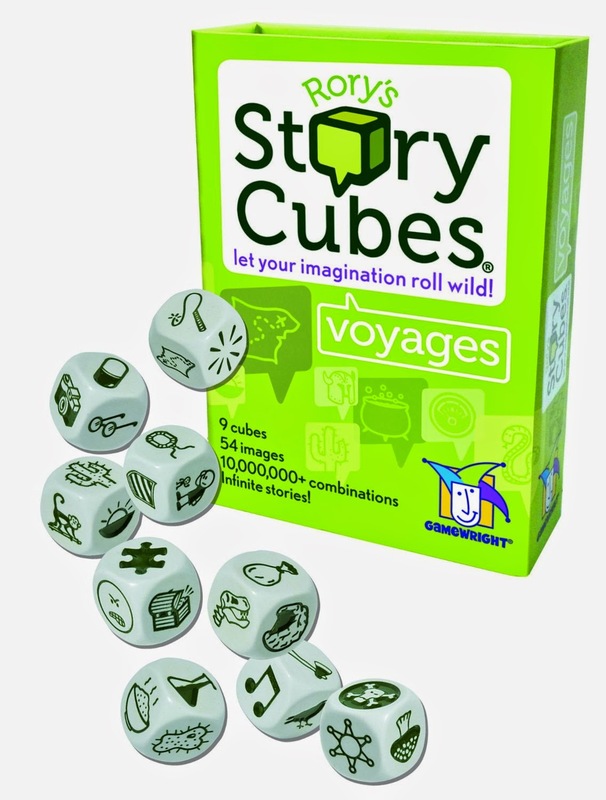 I liked the look of the Voyages set because it lends itself to more adventure/travel stories and I'm big on building up a spirit of adventure just like I am about telling stories to begin with. I think there is something to the idea of traveling the world, having adventures, and learning to share them with others. This sounds so fun! You should type out a story or two for posting. I know I'm not the only one who would love to read that. This looks like a great resource. I'll have to keep it in mind for a certain someone in a few years. :-) Though I have often thought of reasons to read, I hadn't really thought of reasons to tell stories, though my kids were encouraged to write them (and all did when they were young). I wish I had done more of that growing up. Once again, I am ditto-ing BerlinerinPoet--yes, yes, please DO share a story with us! !